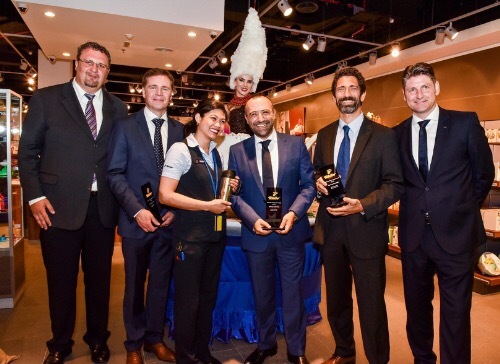 German Retailer Tchibo announced the grand opening of a first-of-its-kind Tchibo Shop & Tchibo Coffee in Dubai Mall. Following the well-known Tchibo business model in Germany and across Europe, the Tchibo Shop offers a fusion of coffee and non-food items to its customers, providing an unrivalled shopping concept that is unlike any other retailer the Middle East region has welcomed before. From its humble beginnings as a coffee mail-order firm, Tchibo expanded from just coffee, to coffee machines, clothing, household items, electronics and electrical appliances, in just a few years. Today, it became synonymous with enjoyment and lifestyle, offering a myriad of products to all its customers. In a global market where it has become harder to impress the shopper, Tchibo manages to stand out from the rest with its exclusive business model by creating an air of anticipation. Each week boasts a new range of affordable, innovative, and high-quality German products, each exclusive to Tchibo, providing customers with choices and a shopping experience like no other. Tchibo already owns and operates eight Tchibo shops around the UAE. Over the past 66 years, many have come to know and love Tchibo, the one-stop-shop for every household item under the sun. Over the years Tchibo has established itself as a household name in Germany, with more than 2,000 stores and 66,000 retail points around the world. It is now making waves all over Europe, with a loyal following comprising millions of satisfied customers in Germany, Austria, Switzerland, Poland, Czech Republic, Turkeyand many others. Its debut in the UAE is a stepping-stone for more store openings to come across the region in the near future. In 1949, Max Herz, a merchant by training, and his business partner Carl Tchiling, laid out the foundations for today’s Tchibo Group. Their business idea of sending roasted coffee to customers by mail revolutionises the coffee market. In 1972 the Tchibo Coffee Service was founded in Germany to provide the out-of-home market with quality coffee and related products. It made the leap from a national to a successful internationally operating company in 1991, when in the United Kingdom, Tchibo Coffee International was established. Within a few years, Tchibo Coffee Service Group grew – through determined expansion in Central and Eastern European Countries – into one of Europe’s leading coffee provider. Tchibo’s passion for coffee ensures pure coffee enjoyment in every cup. Trading in only the world’s finest coffees, Tchibo today provides the ultimate choice in coffee competence and quality, taking care of all aspects of coffee from bean through to the cup. This commitment is the guarantee of the highest quality, which ensures enjoyment. For all our coffees we use only the finest beans from high quality Arabica coffee plants. Our own coffee experts ensure up-to-date market knowledge through direct contact with producers in the major coffee-growing countries. We are committed to sustainable, environmentally friendly and socially responsible coffee growing. This is how we secure our first-class quality in the long run. For different forms of coffee enjoyment, our experts develop our own diverse recipes. Tchibo offers a diverse range of coffees for all contemporary forms of preparation, through which quality and freshness can be experienced. Our product range comprises coffees for individual taste preferences and different price categories and also includes specialities for the most refined requirements. A clearly structured coffee range and simple claims provide information to our customers. Continuous research and development of coffee machines and attractive accessories complete our coffee offer. Posted on May 12, 2015, in #middleast, #retail. Bookmark the permalink. Leave a comment.